Hummingbirds are tiny, but they face big conservation threats. Because of their small size, these birds are often at greater risk than larger birds that may have more ability to adapt. Fortunately, understanding the threats to hummingbirds is the first step to learning how you can help with hummingbird conservation. Habitat Loss: While all birds and wildlife suffer from habitat loss, the growth of urbanization, agriculture, logging and development in tropical areas threatens dozens of hummingbird species, and because these birds are so small and have correspondingly small territorial needs, even minor development can have a tragic impact on rare species. 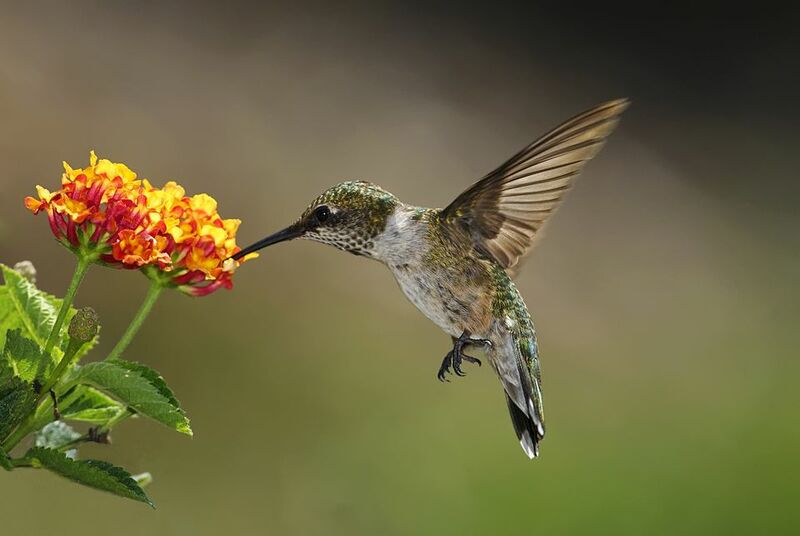 Pesticides: Not only do pesticides and insecticides eliminate the insects that are an essential food source for hummingbirds, but the concentration of chemicals in the environment can impact these small birds far sooner than larger species. Improper chemical use can easily poison hummingbirds. Cats: Feral cats as well as outdoor pets are a major threat to hummingbirds. Because hummingbirds feed repeatedly at the same food sources, a cat can lie in ambush and one swipe of a paw can kill a hummingbird where a larger bird may only be stunned and could still escape. Window Collisions: Because many hummingbird feeders are placed near windows to provide good views of the feeding birds, window collisions can be common and deadly. Not only can the trauma of an impact hurt or kill a hummingbird, but if the bird's bill is damaged it may not be able to feed properly. Bad Feeders: Dirty hummingbird feeders can harbor toxic mold that kills hummingbirds, and feeders that leak excessively can attract bees and wasps that will attack hummingbirds. Rancid nectar can also be deadly to hummingbirds. Invasive Plants: Invasive plants are often chosen for ornamental value in landscaping but can quickly crowd out native nectar-producing plants essential for hummingbirds to feed. While beautiful, these new plants are unfamiliar to hummingbirds and do not provide the nectar they require. Poor Weather: Sudden cold weather can be fatal to these small birds, for while the torpor state can help them conserve energy on cool nights, it can be difficult to recover from extreme cold, especially if food sources are scarce. Storms can also destroy food sources, making recovery even more challenging. Support habitat conservation through donations to appropriate organizations, and choose tropical products such as shade grown coffee that are produced with conservation in mind. Minimize pesticide use on your landscaping or choose organic insect control methods. Never spray insecticides near hummingbird feeders. Keep cats indoors and take steps to discourage feral cats in your backyard to protect hummingbirds and other backyard birds. Take steps to prevent bird window collisions by placing hummingbird feeders appropriately in relation to windows and breaking up window reflections near where the birds feed. Clean hummingbird feeders regularly and use the proper hummingbird nectar recipe to provide appropriate nutrition for backyard hummingbirds. Choose native flowers to attract hummingbirds when planning your bird-friendly landscaping and maintain plants well to encourage healthy, abundant blooms. Keep hummingbird feeders in sheltered areas away from wind and rain, and take steps to keep hummingbird nectar from freezing when poor weather threatens. By knowing how hummingbirds are threatened, it is easy to take steps to help with the conservation of these tiny, enchanting birds. Can Bird Extinction Be Stopped?